Minesweeper easily trains your brain and increase the speed of your thinking. At the same time it is fun and challenging logic puzzle. The objective of the minesweeper game is to demine minefield without detonating any of the land mines. Use flags to mark mines and tap numbers to open safe squares. 🏆 Online Tournament, compete with your friends or any player around the globe. 📌 Unique features: magic wand of luck, guess free boards and smart hints. 📌 Game controls are highly optimized for android touch screens. 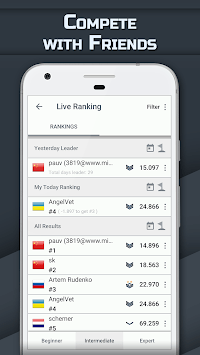 You will get the best classic minesweeper experience on android devices. Why choose this Minesweeper app? – Create custom minefields. Change board size and number of mines including 3BV control of the board. Are you advanced player and want to beat minesweeper records? Then you can leverage chord recursion options game gives to you. 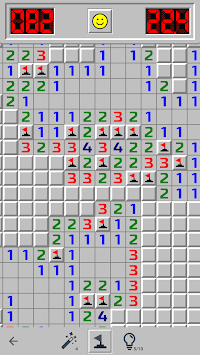 Can you win all three classic minesweeper game levels? Then you are good enough to be listed in World Ranking and to join Minesweeper Community. 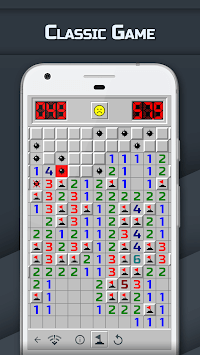 Minesweeper GO is free to play on android. This game has a lot of advanced features for the sake of seasoned minesweeper players just for free. Download minesweeper now and became smarter! We are working hard to give you high quality apps. Thanks!